Marv Cook was another underrated player out of the University of Iowa, finishing second on the school’s all-time list with 126 catches. 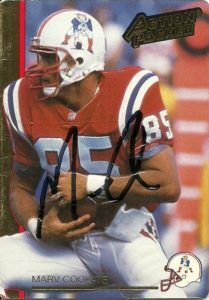 Drafted by the New England Patriots during their darkest times in 1989, Marv Cook would lead AFC tight ends in receptions in 1991 when the team bottomed out. Surprisingly in 1991 he’d also be named first-team AP as his 82 receptions ranked 4th in the league that season. 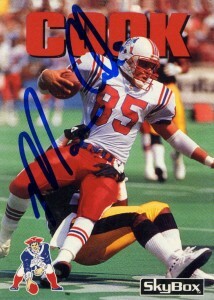 At the time Tecmo Super Bowl rewarded him by- making him one of the slowest receivers EVER. It didn’t help that Cook offered up a woeful 8.8 yards a reception over his career with the Patriots, but he could be counted on to make the catch in those 4 seasons with the team. 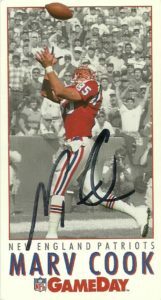 Among his other accomplishments with the Patsies was that he was the first tight end in the history of the franchise to finish 3 consecutive seasons with 50 or more receptions. 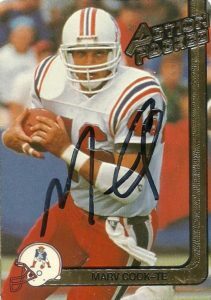 In 1994 Cook would head over to the Bears, starting 8 games and then finish out his career in 1995 with the St. Louis Rams in two lackluster seasons. 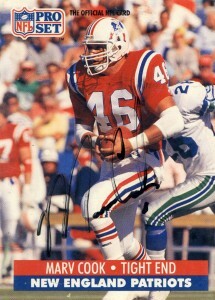 While with the Patriots Marv wore two different jersey numbers: 46 and 85. 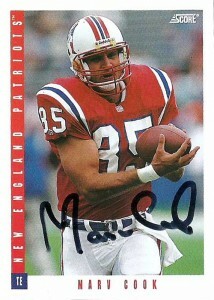 At the time of this post Marv currently is coaching football and associated with a financial advisor network.